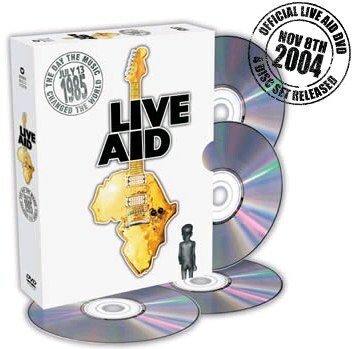 Live Aid was released on a 4CD box set on 8th November 2004. The 'biggest concert in Rock 'n' Roll history' will be released on DVD worldwide on November 8th, 2004. The unforgettable global event, staged in London and Philadelphia on Saturday 13 July 1985, was watched on television by over 1.5 billion people around the world. These concerts led to pledged donations and royalties of over $140 million towards the devastating famine in Africa, and was a veritable who's who of the music business, with an incredible line-up of everyone from Paul McCartney and Bob Dylan, to David Bowie, Queen, U2, taking in the likes of Crosby Stills & Nash, Ozzy Osbourne, Madonna, and Eric Clapton, amongst others. The DVD set is being sold for the Live Aid Trust - the proceeds from every copy goes straight to the charity itself. With a stellar line-up, covering some of the greatest songs ever, it is surely an essential for every home! The four-disc set features English, Dutch, French, German, Italian, Portuguese & Spanish subtitles (on the UK/European version of the set), and worldwide editions all feature Dolby Digital 5.1 Surround Sound, DTS 5.1 Surround Sound & Dolby Digital 2.0 Stereo; the picture format is 4:3 full frame. Orders are now being taken through these special links: US/International, UK/Elsewhere, France, or Germany. The discount that is offered through the UK and US links does NOT affect what the charity receives - they are guaranteed a set amount per set sold.